Everyone’s eyes are different. Some are fortunate enough to have great vision for most of their lives. However, many people have poor eyesight and need to wear glasses or contact lenses. If you wear contact lenses or you’re considering getting them, here are some tips to consider. 1) Contact lens manufacturers stress the importance of washing hands with soap prior to inserting contact lenses. However, you should avoid soaps with moisturizer because they may leave a residue on your hands, which can get on the contacts or in the eye. 2) Don’t overwear contact lenses. You may not see or feel problems at first, but things start off microscopic and build over time. Before you know it, a few large problems can happen. The eye becomes deprives of oxygen. Next, veins form around the eye that become more pronounced and noticeable over time. This is called neovascularization or new blood vessels. Another common problem is called Giant Papillary Conjunctivitis (GPC). GPC is an allergic response causing giant inflammatory bumps under the eyelids. If you get GPC, you’ll experience excessive contact lens movement, protein build-up, and constant eye irritation. A lack of oxygen is also a trigger for a bacterial ulcer that can occur from contact lens overwear. This is very painful and can obstruct sight if not treated quickly. Treatment entails frequent antibiotics and no contact lens wear for at least a week. 3) Sleeping in contacts can cause the same problems as overwearing contacts. Unless it’s a short nap, it’s best to avoid wearing contacts while you sleep unless you’re wearing something like Air Optix Night & Day lenses. These lenses are FDA approved to sleep in for one month under a doctor’s supervision. 4) Silicone Hydrogel lenses have the maximum amount of oxygen permeability and can be worn safely all day for most people. 5) Maturation and responsibility need to be taken into consideration when it comes to determining the right age to start wearing contact lenses. In our office, we recommend 12-years-old as a good age with the parent’s approval. 6) Carry a bottle of non-preservative artificial tears during the day in case your eyes feel dry or irritated. Gels can be used for moderate-to-severe dry eyes. 7) Before you put in your contacts, use a gentle circular motion with the pad of your finger to rinse the contact lens in the palm of your hand. This helps make sure the lenses are safe and clean. 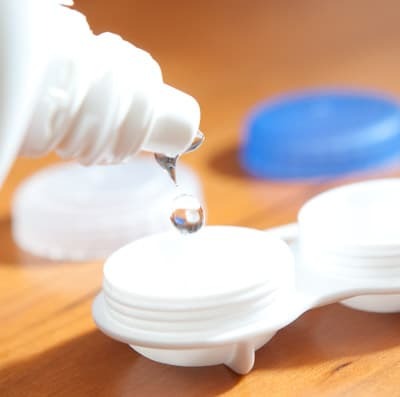 8) Clean the lenses daily (or weekly) with a toothbrush and liquid soap or multipurpose solution, then lay the cases face down on a towel to dry. This avoids new bacteria and dust from entering the clean case. Never use tap water in the contact lens case. This can cause a serious eye infection. When the bottle of multipurpose solution is finished, throw away the old case. The new bottle will usually include a case in the box. Never reuse multipurpose solution after storing contact lenses in the case. Dump out the solution in the case every time. 9) Strongly consider using daily disposable lenses. Daily lenses cut the risks of infections and other related problems. The other important benefits of daily contact lenses are the comfort, convenience, and overall improved long-term eye health. 10) Only use contacts safely and responsibly. If not, you’re setting yourself up for long-term. You only get one pair of eyes, so take care of them!